Christian Writer/Reader Connection: Giveaway Time! 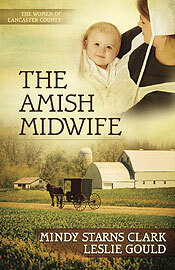 The Amish Midwife has a mix of Amish and English characters. Mindy and Leslie present a clash of cultures, and serve up a tantalizing mystery. 1) The giveaway is open to residents of the United States. 2) Only Followers of Christian Writer/Reader Connection are eligible to participate. 3) Leave a comment on this post with your email address. Sorry, no email = no entry. You can get extra entries by posting this giveaway on Facebook, Twitter, or your blog. Please notify me in the comments if you choose to share this opportunity with your friends and blog readers. 4) Deadline: Thursday, 10/18/12, at 11:59 P.M. The winner will be announced at the end of the blog post on Friday, 10/19/12. Disclaimer: Neither the publisher nor the authors provided this book or gave me any remuneration for this giveaway. Hi Susan .. there must be so much to the Amish peoples, so this sounds interesting ... lucky person who gets to win ..
Hi Hilary - Amish books are all the rage here in the U.S.
Hi Karen - I think you'll enjoy it. Hi Terri - Thanks for stopping by. I love the barn picture on the cover. I have always been attracted to the Amish. I have read some of the early books to hit the shelves by Beverly Lewis and even a very old one. I would like to let someone else win this one. Thanks so much for the offer. Thanks for stopping by and commenting. I also like Beverly Lewis. I would love a chance to read this book, Susan! Thanks for offering the giveaway.